Every Guest Room features a furry, huggable Teddy Bear made from the luxurious Alpaca Fiber. We believe these are quite possibly the “softest, most huggable bears in the world”. They are very popular with our Guests, many of whom like purchasing “their guest room companion bear” home as a memento of their stay! All these and more are featured in the Maple Hill Manor Farm Store, which is always accessible to Guests during their stay. 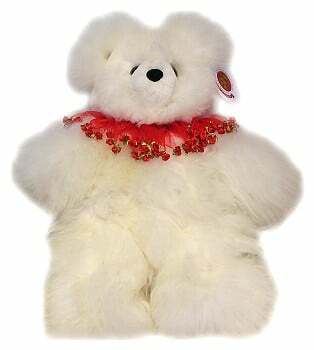 Our Alpaca Fur Bears are a favorite item and come in a wide variety of colors and sizes. Alpacas produce 23 natural colors, more than any other fiber-producing animal in the World. Several bears are “hibernating” in the farm store, all of which are available for sale as well. Priced from $14.95 to $36.95.